Las Vegas has no shortage of places to go if you’re looking to listen to a little good old rock ‘n’ roll. However, if you are looking for the ultimate classic rock experience, Raiding the Rock Vault at the Hard Rock Hotel and Casino is a must-see! Featuring an all-star mega group of rock and roll legends, your cheap Las Vegas Raiding the Rock Vault tickets take you on a journey through classic rock ‘n’ roll history. The live concert experience stars the who’s who of classic rock, including Rock and Roll Hall of Famer Howard Leese (Heart, Bad Company), Robin McAuley (Survivor), Paul Shortino (The Cult, Quiet Riot), Andrew Freeman (Lynch Mob, The Offspring), Jay Schellen (Badfinger, Asia), Michael T. Ross (Lita Ford Band) Carol-Lyn Liddle (Masters of Rock). Special guests have included Lou Gramm from Foreigner, Toto front man Bobby Kimball, Yes lead singer Jon Anderson and Mickey Thomas of Starship. 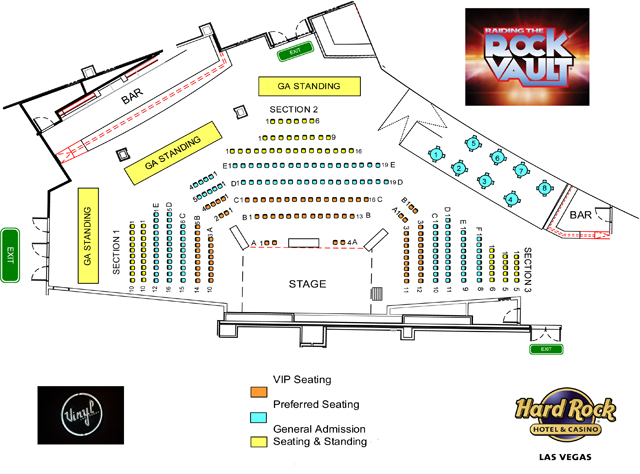 Get your low-priced Las Vegas Raiding the Rock Vault tickets from VEGAS (the app) today for a one-of-a-kind rock ‘n’ roll concert experience that’s been voted the “Best Musical” in Las Vegas two years in a row by Las Vegas Review Journal! Raiding the Rock Vault brings the history of rock ‘n’ roll to life, featuring classic anthems by the biggest acts in music including The Rolling Stones, The Who, The Doors, Jimi Hendrix, Led Zeppelin, Deep Purple, Free, Eagles, Fleetwood Mac, Queen, Boston, Kansas, U2, Aerosmith, Van Halen, AC/DC, Pat Benatar, Foreigner, Heart, Journey, Bon Jovi, Whitesnake, Supertramp and many more. Raiding the Rock Vault was voted as readers’ choice for “Best Musical” (2014, 2015) and “Best Tribute Show” (2016) in Las Vegas Review-Journal’s Best of Las Vegas Awards and has consistently been ranked the No. 1 performance in Las Vegas on TripAdvisor. Raiding the Rock Vault tells the story of classic rock from the 1960s to the 1980s and is performed by members of some of the greatest rock bands in history.